It wasn’t quite the Preakness, leaving the pundits baffled by a filly winning for the first time in almost a century, but the box office race was closer than expected. The raw estimates for the weekend: Angels & Demons $48 million, Star Trek $43 million. In movie-industry terms, nearly a photo finish. There’s the kind of movie people see because they have to: because it’s the weekend’s big new attraction, and marketing and habit have schooled them to want to see it on opening day. And occasionally there’s a film people see because they want to: because a friend had told them it’s fun, or they’ve already enjoyed it and want to return. 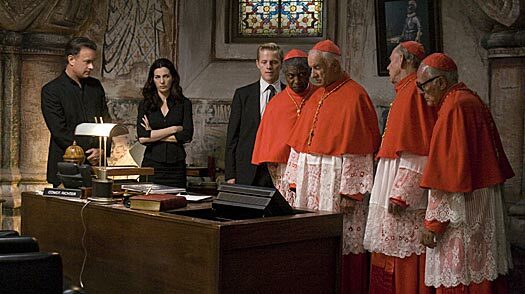 This weekend, obligation was represented by Angels & Demons, a sequel of sorts to the 2006 super-hit The Da Vinci Code, with the same star, Tom Hanks, and director, Ron Howard; and pure movie pleasure by last week’s winner Star Trek, which has enjoyed enthusiastic reviews and word-of-mouth. Angels beat Trek, but not quite in the way a debuting blockbuster should steamroll a movie that opened the previous weekend. The reasons for the relatively close finish  a new hit typically doubles the weekend take of the movie it’s replaced  are easy to enumerate. The Da Vinci Code was a publishing phenomenon with the added balm of religious controversy; the movie version earned $77 million its first weekend. Angels, actually a prequel, didn’t generate the kind of heat that spurs audiences to see it immediately. Also, Dan Brown, the author of both Da Vinci and Angels, is a powerhouse literary name but not yet a mega-movie franchise; Star Trek, the latest in a series of film spin-offs that date back 30 years, has brand recognition few can match. And the target audience for best-selling novels made into movies is older than the action-fantasy crowd, and typically slower to get themselves into theaters. Finally, there’s the man above the title. A genuine star who makes hit movies, Hanks has headlined 14 films with a domestic gross of more than $100 million  more than Will Smith or Julia Roberts or Adam Sandler ; only Tom Cruise can match that haul. But his films usually don’t open with a big bang; audiences discover them over time, and by the end he has a Forrest Gump. At 52, Hanks is not the ideal age for a teen kid’s movie icon; his one starring role since Da Vinci, in Charlie Wilson’s War, brought in only $65 million. So Hanks should probably be happy with the huge salary he earned for making Angels, for the fact that it did manage to edge out the competition for the weekend’s No.1 slot.